NO TUSCANY ON 12/24. Merry Christmas, dear fans and friends! Fri. the 8th: NO BARRYMORE THIS FRIDAY! Fri. the 1st: The Barrymore Restaurant, 6:00 - 9:00pm. The 31st - New Years Eve: Alizé at the top of the Palms, 9:00pm - 1:00am. Thurs. the 10th: Greystone Mansion, Los Angeles, private event. Thurs. the 6th: Bally's, private event. Sat. the 6th: Caesar's Palace 50th Anniversary Gala, invitation-only event. Thurs. the 25th: The Bellagio, private event. Tues. the 19th: Mandarin Oriental, private event. Sat. the 5th: Mandalay Bay, Skyfall, private event. Sun. the 11th: Maggiano's, The Fashion Show, 1:00-4:00pm, private event. Sun. the 25th: The Springs Preserve, 1:00-4:00, private event. Thurs. the 10th: Hard Rock Café at Hard Rock Hotel, 8:00 - 11:pm, all ages. Sat. the 12th: Tropicana Hotel, private event. Thurs. the 17th: Hard Rock Café at Hard Rock Hotel, 8:00 - 11:pm, all ages. Thurs. the 24th: Hard Rock Café at Hard Rock Hotel, 8:00 - 11:pm, all ages. Sun. the 5th: The Bootlegger Bistro, 6:45 - 9:30pm. Sun. the 26th: The Bootlegger Bistro, 6:45 - 9:30pm. Sun. the 1st: Sam's Town Hotel/Casino, Main Showroom, "Vintage Vegas Live!" 1:00pm show, doors at 12:00pm, free w/club card. Sun. the 1st: The Bootlegger Bistro, 6:45 - 9:30pm. Tues. the 10th: Bellagio, The Bank nightclub, private event. Thurs. the 12th: The Wynn, private event. Mon., the 1st: Tuscany Suites and Casino, Piazza Lounge, 6:30 - 10:30pm. Thurs., the 4th: Palms Resort, private event. Sun., the 7th: The Bootlegger Bistro, 6:45 - 9:30pm. Mon., the 8th: Tuscany Suites and Casino, Piazza Lounge, 6:30 - 10:30pm. Sat., the 13th: 6th Annual US Marine Corps Toys for Tots Benefit, Westgate Hotel, 8:00pm. Sun., the 14th: The Bootlegger Bistro, 6:45 - 9:30pm. Mon., the 15th: Tuscany Suites and Casino, Piazza Lounge, 6:30 - 10:30pm. 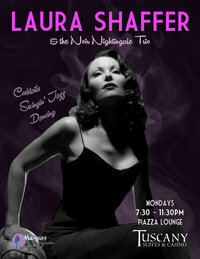 Sun., the 21st: The Bootlegger Bistro, 6:45 - 9:30pm. Fri., the 26th: Oscar's, The Plaza Hotel, 6:30-10:30pm. Sat., the 27th: Oscar's, The Plaza Hotel, 6:30-10:30pm. Sun., the 28th: The Bootlegger Bistro, 6:45 - 9:30pm. Mon., the 29th: Tuscany Suites and Casino, Piazza Lounge, 6:30 - 10:30pm. Weds., the 31st: Suncoast Hotel and Casino, private event. Sun., the 2nd: The Bootlegger Bistro, 6:45 - 9:30pm. Mon., the 3rd: Tuscany Suites and Casino, Piazza Lounge, 6:30 - 10:30pm. Sun., the 9th: The Bootlegger Bistro, 6:45 - 9:30pm. Mon., the 10th: Tuscany Suites and Casino, Piazza Lounge, 6:30 - 10:30pm. Thurs., the 13th: Tower of Jewels, private event. Fri., the 14th: Oscar's, The Plaza Hotel, 7 - 11:00pm. Sat., the 15th: Oscar's, The Plaza Hotel, 7 - 11:00pm. Sun., the 16th: The Bootlegger Bistro, 6:45 - 9:30pm. Mon., the 17th: Tuscany Suites and Casino, Piazza Lounge, 6:30 - 10:30pm. Sun., the 23rd: The Bootlegger Bistro, 6:45 - 9:30pm. Mon., the 24th: Tuscany Suites and Casino, Piazza Lounge, 6:30 - 10:30pm. Tues., the 25th: Smith Center, Cabaret Jazz, 7:00pm. Fri., the 28th: Oscar's, The Plaza Hotel, 7 - 11:00pm. Sat., the 29th: Oscar's, The Plaza Hotel, 7 - 11:00pm. Sun., the 30th: The Bootlegger Bistro, 6:45 - 9:30pm. Sat., the 4th: Aliante Casino Showroom, private event. Sun., the 5th: The Bootlegger Bistro, 6:30 - 9:30pm. Mon., the 6th: Tuscany Suites and Casino, Piazza Lounge, 6:30 - 10:30pm. Weds., the 8th: Andre's, Monte Carlo Hotel Casino, private event. Sun., the 12th: The Bootlegger Bistro, 6:30 - 9:30pm. Mon., the 13th: Tuscany Suites and Casino, Piazza Lounge, 6:30 - 10:30pm. Sun., the 19th: The Bootlegger Bistro, 6:30 - 9:30pm. Mon., the 20th: Tuscany Suites and Casino, Piazza Lounge, 6:30 - 10:30pm. Sun., the 26th: The Bootlegger Bistro, 6:30 - 9:30pm. Mon., the 27th: Tuscany Suites and Casino, Piazza Lounge, 6:30 - 10:30pm. Weds., the 3rd: Kierland Resort, Scottsdale. Private event. Sun., the 7th: The Bootlegger Bistro, 6:30 - 9:30pm. Fri., the 12th: Green Valley Ranch Resort and Spa, private event. Sun., the 14th: The Bootlegger Bistro, 6:30 - 9:30pm. Sun., the. 21st: The Bootlegger Bistro, 6:30 - 9:30pm. Mon., the 22nd: Tuscany Suites and Casino, Piazza Lounge, 6:30 - 10:30pm. Sun., the 28th: The Bootlegger Bistro, 6:30 - 9:30pm. Sun., Aug. 3rd: The Bootlegger Bistro, 6:30 - 9:30pm. Mon., Aug. 4th: Tuscany Suites and Casino, Piazza Lounge, 6:30 - 10:30pm. Sun., Aug. 10th: The Bootlegger Bistro, 6:30 - 9:30pm. Mon., Aug. 11th: Tuscany Suites and Casino, Piazza Lounge, 6:30 - 10:30pm. Sun., Aug. 17th: The Bootlegger Bistro, 6:30 - 9:30pm. Mon., Aug. 18th: Tuscany Suites and Casino, Piazza Lounge, 6:30 - 10:30pm. Sun., Aug. 24th: The Bootlegger Bistro, 6:30 - 9:30pm. Mon., Aug. 25th: Tuscany Suites and Casino, Piazza Lounge, 6:30 - 10:30pm. Sun., Aug. 31st: The Bootlegger Bistro, 6:30 - 9:30pm. Fri., July 4th: Caesar's Palace, Private Event. Sun., July 6th: The Bootlegger Bistro, 6:30 - 9:30pm. Mon., July 7th: Tuscany Suites and Casino, Piazza Lounge, 6:30 - 10:30pm. Sun., July 13th: The Bootlegger Bistro, 6:30 - 9:30pm. Mon., July 14th: Tuscany Suites and Casino, Piazza Lounge, 6:30 - 10:30pm. Sun., July 20th: The Bootlegger Bistro, 6:30 - 9:30pm. Mon., July 21st: Tuscany Suites and Casino, Piazza Lounge, 6:30 - 10:30pm. Sat., July 26th: West Wing Cigar Lounge, 8:00 - midnight. Sun., July 27th: The Bootlegger Bistro, 6:30 - 9:30pm. Mon., July 28th: Tuscany Suites and Casino, Piazza Lounge, 6:30 - 10:30pm. Sun., June 1st: The Bootlegger Bistro, 6:30 - 9:30pm. Mon., June 2nd: Tuscany Suites and Casino, Piazza Lounge, 6:30 - 10:30pm. Sun., June 8th: The Bootlegger Bistro, 6:30 - 9:30pm. Mon., June 9th: Tuscany Suites and Casino, Piazza Lounge, 6:30 - 10:30pm. Sun., June 15th: The Bootlegger Bistro, 6:30 - 9:30pm. Mon., June 16th: Tuscany Suites and Casino, Piazza Lounge, 6:30 - 10:30pm. Thurs., June 19th: Private Event. Sun., June 29th: The Bootlegger Bistro, 6:30 - 9:30pm. Mon., June 30th: Tuscany Suites and Casino, Piazza Lounge, 6:30 - 10:30pm. Mon., May 5th: Tuscany Suites and Casino, Piazza Lounge, 6:30 - 10:30pm. Thurs., May 8th: Suncoast Hotel and Casino, Suncoast Showroom, 2:pm. Sun., May 11th: The Bootlegger Bistro, 6:30 - 9:30pm. Mon., May 12th: Tuscany Suites and Casino, Piazza Lounge, 6:30 - 10:30pm. Sat., May 17th: Private Wedding, Las Vegas Country Club, 7:pm. Sun., May 18th: The Bootlegger Bistro, 6:30 - 9:30pm. Mon., May 19th: Tuscany Suites and Casino, Piazza Lounge, 6:30 - 10:30pm. Sun., May 25th: Private event, 4:30pm. Sun., May 25th: The Bootlegger Bistro, 6:30 - 9:30pm. Mon., May 26th: Tuscany Suites and Casino, Piazza Lounge, 6:30 - 10:30pm. Fri., May 30th: National Anthem, Legion of Honor medal ceremony, Silverton Hotel, 2:pm. Sat., May 31st: Private Event, Revere Golf Club, 8:pm. Sun., April 6th: The Bootlegger Bistro, 6:45 - 9:30pm. Mon., April 7th: The Tuscany Suites and Casino, T Spot Lounge, 6:30 - 10:30pm. Thurs., April 10th: The Dennis Bono Show, main showroom, Southpoint Hotel & Resort, 2:00pm. Thurs., April 10th: Nevada Energy GREENfest Green Carpet reception, private event. Fri., April 11th: Private event. Sun., April 13th: The Bootlegger Bistro, 6:45 - 9:30pm. Mon., April 14th: Tuscany Suites and Casino, Piazza Lounge, 6:30 - 10:30pm. Sun., April 20th: The Bootlegger Bistro, 6:45 - 9:30pm. Mon., April 21st: Tuscany Suites and Casino, Piazza Lounge, 6:30 - 10:30pm. Sat., April 26th: Private event. Mon., April 28th: Tuscany Suites and Casino, Piazza Lounge 6:30 - 10:30pm. Sun., March 2nd: The Bootlegger Bistro, 6:45 - 9:30pm. Fri., March 7th: Maîtres Cuisiners de France World Meetings and Gala, Venetian. Private event. Sun., March 9th: The Bootlegger Bistro, 6:45 - 9:30pm. Tues., March 11th: The Cosmopolitan, Bamboo Pool, 7:00 - 11:00pm, Private event. Thurs., March 13th: The Venetian, 6 - 9:00pm, private event. Sun., March 16th: The Bootlegger Bistro, 6:45 - 9:30pm. Thurs., March 20th: The Mandarin Oriental, Mandarin Sky Bar, Private event. Sun., March 23rd: The Bootlegger Bistro, 6:45 - 9:30pm. Sat., March 29th: 'Midnight Muse' Movie Premiere and Concert, Inspire Theater, doors at 6:30pm. Sun., March 30th: Caesars Palace, private event. Mon., March 31st: The Tuscany Suites and Casino, Piazza Lounge, 6:30 - 10:30. Feb. 2nd: The Bootlegger Bistro, 6:45 - 9:30pm. Feb. 6th: The Dennis Bono Show, main showroom, Southpoint Hotel & Resort, 2:00pm. Feb. 8th: La Casa Vegas Cigars and Lounge, 9pm - 12am. Feb. 9th: The Bootlegger Bistro, 6:45 - 9:30pm. Feb. 14th: Eiffel Tower Restaurant, The Paris Hotel & Casino, 5:30 - 10:30pm. Feb. 16th: The Bootlegger Bistro, 6:45 - 9:30pm. Feb. 22nd: Art Vargas' "Vintage Vegas Live" show, Starbright Theater, 7:00pm. Feb. 23rd: The Bootlegger Bistro, 6:45 - 9:30pm. Feb. 25th: "Second Wind Dreams", charity event.